Last Week in Review: The housing, manufacturing and labor sectors have been struggling of late. Plus, the minutes from the Fed's latest meeting were released. Forecast for the Week: Several key housing reports are ahead, plus a look at U.S. growth and consumer attitudes. View: What is your body language saying to your clients? Use the simple tips below to avoid common mistakes many people make. "Winter is coming." George R.R. Martin. Winter has long arrived in many parts of the country, and it is being cited as a reason for several weaker than expected economic reports. Read on for details, and what they mean for home loan rates. After making important improvements last year, the housing sector has struggled of late. January Housing Starts declined by 16 percent from December, and have been declining since November's annual rate of 1.101 million, which was the highest since 2008. Building Permits, a sign of future construction, also fell 5 percent in January from December, while Existing Home Sales declined by 5.1 percent. In addition, the National Association of Home Builders Housing Market Index came in at 46, the lowest reading since last May. Readings over 50 indicate that more builders view conditions as good, rather than poor. The NAHB said that weather conditions across the country led to a decline in buyer traffic last month. In the manufacturing sector, both the Empire State Manufacturing Index and the Philadelphia Fed Index fell in February, coming in well below expectations. The labor market is also struggling, as Weekly Initial Jobless Claims came in at 336,000 and continue to hover around this number. Meanwhile, inflation at both the consumer and wholesale level remains tame. What does this mean for home loan rates? Remember that the Fed is now purchasing $35 billion in Treasuries and $30 billion in Mortgage Bonds (the type of Bonds on which home loan rates are based) to help stimulate the economy and housing market. This is down from the original $85 billion per month that the Fed had been purchasing. The minutes from the Fed's recent meeting of the Federal Open Market Committee revealed a lack of consensus on this topic. If economic data continues to be weak, the Fed may have to rethink the tapering it has begun. 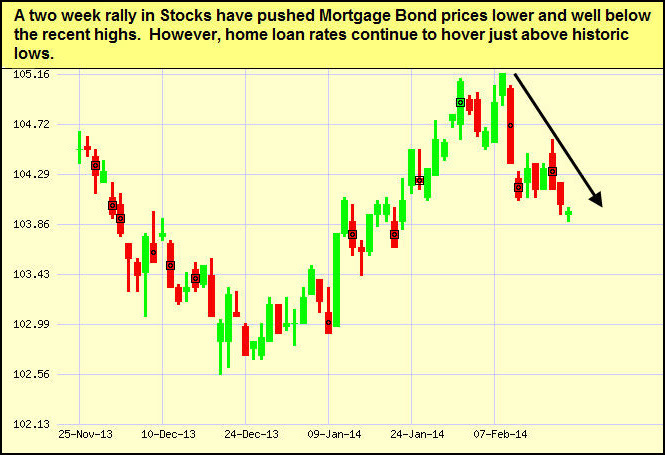 This will be a key story that could impact the markets and home loan rates in the weeks and months to come. The bottom line is that now remains a great time to consider a home purchase or refinance, as home loan rates remain attractive compared to historical levels. Let me know if I can answer any questions at all for you or your clients. The economic calendar is busy this week with several housing reports front and center. Look for the S&P/Case Shiller Home Price Index on Tuesday, New Home Sales on Wednesday, and Pending Home Sales on Friday. We'll get a read on consumer attitudes with Consumer Confidence on Tuesday and the Consumer Sentiment Index on Friday. As usual, Weekly Initial Jobless Claims will be reported on Thursday. Thursday also brings January's Durable Goods Orders, which are orders for items that last for an extended period of time. On Friday, look for the second reading of Gross Domestic Product for the fourth quarter of 2013, as well as Chicago PMI, a key manufacturing report. Remember: Weak economic news normally causes money to flow out of Stocks and into Bonds, helping Bonds and home loan rates improve, while strong economic news normally has the opposite result. The chart below shows Mortgage Backed Securities (MBS), which are the type of Bond on which home loan rates are based. When you see these Bond prices moving higher, it means home loan rates are improving and when they are moving lower, home loan rates are getting worse. To go one step further a red "candle" means that MBS worsened during the day, while a green "candle" means MBS improved during the day. Depending on how dramatic the changes were on any given day, this can cause rate changes throughout the day, as well as on the rate sheets we start with each morning. As you can see in the chart below, Bonds have suffered due to the recent rally in Stocks. However, home loan rates remain attractive, hovering just above historic bests. I will continue to monitor them closely. "Posturing" Your Way to Success Do You Make These Common Body Language Mistakes?Body language plays a huge part in the impressions people form of you, and it can enhance or undermine the points you're trying to make.A great way to evaluate your body language is to set up a camera and practice your pitch to your spouse, siblings, or co-workers in a role-play scenario. Talk to them just as you would a client. Then watch the recording and see what your body language is telling people. You may be surprised by what you notice.Here are five simple suggestions for improving your body language: Don't frown at objections. Frowning is a natural reaction in this situation, but remember that frowning indicates defeat or angerand is obviously negative. Smile as you counter the objection with a positive comment. Mirror the other person's body language. This could possibly win them over subconsciously. When you imitate the way people posture themselves, your non-verbal communication says, "I like you, you're just like me." Make appropriate eye contact, but don't stare! An intense stare makes people uncomfortable, and can even make them feel you're a little off balance. On the other hand, if you avoid eye contact, the person you are speaking to will probably think you're lying. Be attentive and smile. Stand up straight. That age-old advice from mom really is important! Slumped shoulders always give a negative impression. Sit forward. When you're sitting behind a desk in front of clients, relax and lean slightly forward with one shoulder as you tilt your head just a bit. This shows you are captivated by what they have to say. On the other hand, leaning back and clasping your hands behind your head may give the impression that you are full of yourself.